Guttation is a secretion of fluid from a plant's leaf that comes onto the surface of the leaf out of specialized pores called hydrathodes. This process happens when the surrounding humidity in the air is high, the soil moisture is high and the rate of transpiration (evaporation) is low. Plants enclosed in a terrarium will sometimes exhibit this phenomenon. 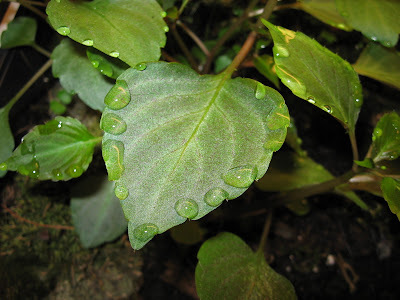 When the water being secreted contains minerals in the solution, like calcium, it will leave a whitish crust on the surface of the leaf when it dries.